The Securities and Exchange Commission (SEC) yesterday announced more options for listed firms to comply with minimum public float rules, the original deadline for which was 31 December 2016. The revised minimum requirements will replace the current listing criteria applicable at the initial listing both on the Main Board and the Diri Savi Board. SEC said the revised rules recognise the contribution made to liquidity from both the free float market capitalisation of a company and its public holding. The free float market capitalisation or the float adjusted market capitalisation is computed by multiplying the public holding percentage of a company by the market capitalisation of such a company. The revision of the public float criteria and the flexibility it affords is expected to encourage more listing on the CSE. The SEC said a minimum public float is generally prescribed for the purpose of increasing capital market liquidity and ensuring that the general public gets an opportunity to invest in listed companies and share in the wealth produced by such entities. Furthermore, it has been observed that the greater and more divested the public holding, the lesser the potential for market abuse and the greater the opportunity to attract investors to the market. In 2013, the Securities and Exchange Commission (SEC), subsequent to a number of public consultations, directed all listed public companies to comply with the rules on minimum public float on a continuous basis. Prior to this directive, even though listed companies had to comply with public float requirements at the point of listing, there was no mandate for companies to continue maintaining a threshold public float requirement. This requirement to maintain a minimum public float was introduced with a view to improving the low liquidity levels prevalent in the market. Listed companies were granted a period of three years to comply with the minimum public float requirements specified both for the Main Board and Diri Savi Board. Subsequent to a follow-up workshop organised by the SEC to discuss issues faced by listed entities to meet the public float requirements on a continuing basis, a review of the status of compliance was conducted by the Colombo Stock Exchange (CSE). The study by the CSE found a high incidence of non-compliance among listed entities. The main reason for non-compliance was attributed to the limited options afforded in the rules for companies to comply with the public float requirements. 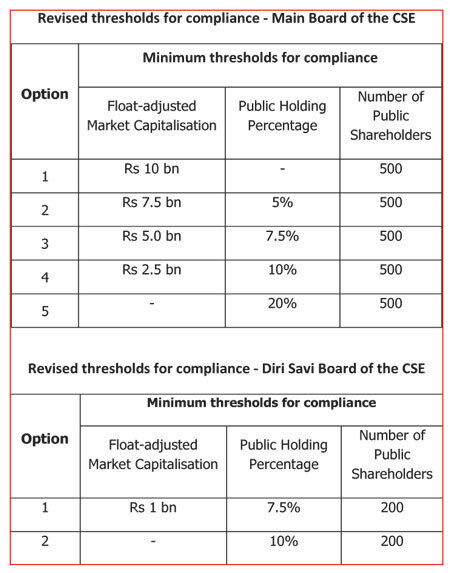 Taking the views of the market into consideration, the SEC in consultation with the CSE, decided to review the rules. Subsequent to such a review, the SEC decided to revise the minimum public float requirements to provide listed public companies with a wider range of options to comply with the rules without compromising the objective of the rule.